Vintage Belt Buckle. 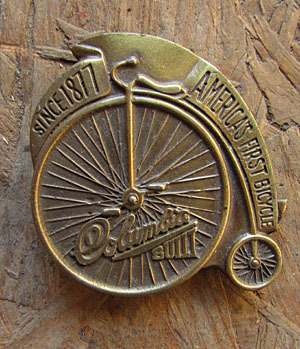 Has the text "Since 1877, Americas First Bycicle, Columbia Built" Over an old school "Penny-Farthing" Bike with "Columbia Built" in the middle. Very Cool, Brassy Finish. Condition: Very Good, Some may have some spots of Patina or be a slightly different color. Measures: Roughly 2" x 2"